Shen Feng Tools - 5 Ton Mechanical Pusher - 5 Ton Mechanical Pusher - Product - Shen Feng Tools Co., Ltd.
CK130 is availbe to be use with internal puller, PK-25-65 to do dismounting work which is not equip with the set. Mechanical pusher is used for installing small size bearings, gears and so on. Providing legs in 3 lengths to meet customers’ needs. 3 legs design divides force equally. Put into sturdy carrying/storage case. Sliding jaws provide easy motion on adjusting. 2 in 1 set, mounting and dismounting work in shortest time, dismounting the shaft without heating. For protecting dismounting object,using patented trisection plate, K3-100. 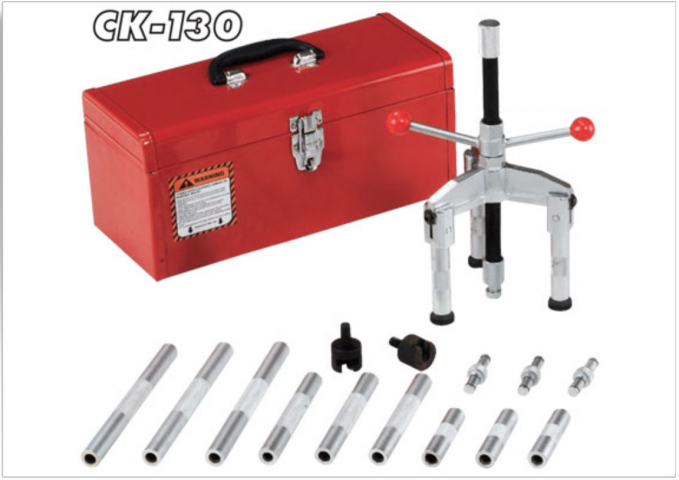 Shen Feng Tools Co., Ltd. is not only makes hydraulic tools also offer professional services that suit your most demanding needs. No. 2, You 7th Rd., Dajia Dist., Taichung City, Taiwan , R.O.C. Copyright © 2019 by Shen Feng Tools Co., Ltd. All Right Reserverd.